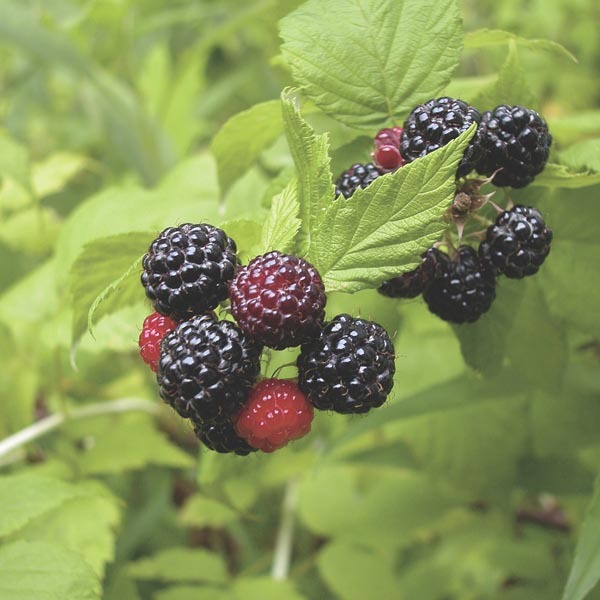 A rugged North American native plant prized for its delicious black berries that are perfect for eating fresh, baking or preserving. Plants provide high yields of tasty fruit. Berries start out red and turn dark purple (black) as they mature. They are sweetest when allowed to reach full maturity before picking. Delicious in pies, tarts, jams, and preserves. The perfect addition to any fresh fruit tray. Serve as a scrumptious dessert or appetizing breakfast. Water 2 - 3 times per week until established. Plant in a reliably sunny spot with plenty of space surrounding the plant. Best in fertile, well-drained soil. Keep well-watered during hot weather. If pruning is needed, do it after the fruiting period has ended. Plant in spring or early fall to give plants the best start. Choose a location that will allow roots to spread and branches to grow freely. Space plants far enough from building foundations, walls, and decks so that the growing foliage won't crowd the structure. Consider whether tall trees or shrubs will block windows or interfere with the roof or power lines. To prepare the planting area dig a hole as deep as the root ball and three times as wide. After removing the soil, mix it with some compost or peat moss. This enriches the soil and loosens the existing dirt so that new roots can spread easily. To remove the plant from the container, gently brace the base of the plant, tip it sideways and tap the outside of the pot to loosen. Rotate the container and continue to tap, loosening the soil until the plant pulls smoothly from the pot. The container can also be removed by carefully cutting it down the side. Set the plant in the hole. If the root ball is wrapped in burlap fabric this must now be removed along with any string or wire securing the burlap. If roots are tightly packed gently rake them apart with your fingers. Return the soil to the planting area packing it firmly around the root ball. Fill the hole until the soil line is just at the base of the plant, where the roots begin to flare out from the main stem. Water the plant well then add a 2” (5cm) layer of mulch, such as shredded bark, around the planting area. Keep the mulch at least 4” (10cm) away from the trunk of the plant as this can keep the bark too moist and cause it to decay. Depending on rainfall, new plants need to be watered weekly through the first growing season. A slow, one-hour trickle of water should do the job. During hot spells thoroughly soaking the ground up to 8” (20 cm) every few days is better than watering a little bit daily. Deep watering encourages roots to grow further into the ground resulting in a sturdier plant with more drought tolerance. To check for soil moisture use your finger or a hand trowel to dig a small hole and examine the soil. If the first 2-4” (5-10cm) of soil is dry, it is time to water. Monitor new plants through the first two years to make sure they are getting the moisture they need. After that they should be sturdy enough to survive on their own. Established trees should be fertilized every 2-3 years. Feed in early spring when plants start growing. Fertilizers are available in many forms: granulated, slow-release, liquid feeds, organic or synthetic. Determine which application method is best for the situation and select a product designed for trees and shrubs, or go with a nutritionally balanced, general-purpose formula such as 10-10-10. Always follow the fertilizer package directions for application rates and scheduling. Over-fertilizing plants or applying at the wrong time during the growing season can result in plant injury. Pruning may be needed to remove dead branches, encourage bushier growth, promote more flowers, or maintain a specific size or shape. Dead branches should be removed close to the trunk, flush with the bark. When pruning to control a plant's size or shape, cuts should be made just above a leaf bud and at a slight angle. This bud will be where the new growth sprouts. Many shrubs can be regularly sheared to keep them shaped as a hedge, edging or formal foundation planting. Always use sharp, clean tools when pruning. There are many tools available depending on the job. Hand shears, pruners, and loppers are ideal for most shrubs. Pole pruners and tree saws are better for large, mature shrubs or trees. If a tree is so large that it can't be safely pruned with a pole pruner, it is best to call in a professional tree service.